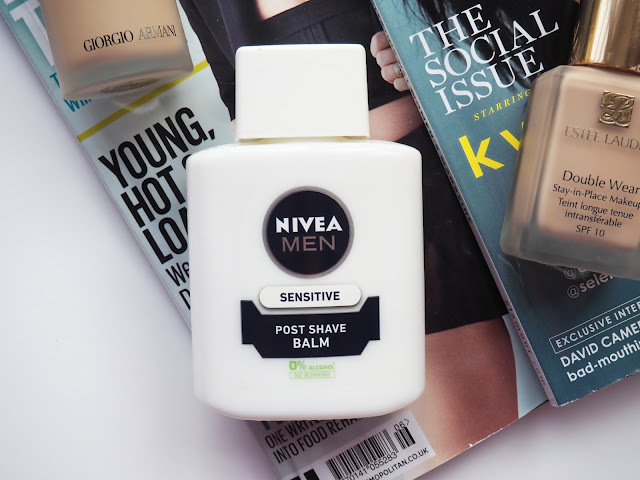 I'd seen all the hype on social media about the Nivea Post Shave Balm and even though people were raving it just didn't interest me at all. However, I saw it on offer in a supermarket (usually £4.50ish) so just figured I'd give it a whirl. Apparently this stuff makes a great base for foundation and primes your face really well, who doesn't want that? Firstly I'll start with a bit of a downside, as its a mens products it does have that kind of mannish scent which I don't mind too much but its not ideal. Having said that, after a few minutes the product has sunk into the skin and the smell is virtually gone, so its really not much of a downside at all. As its a balm its a bit more liquidy than a lotion which I learnt the hard way when a load came out of the bottle and went everywhere, so pour carefully! I've been moisturising my face as usual then taking a 5 pence piece size blob, dotting it on my face before rubbing it in with my fingers. It does need a few mins to dry down and it dries slightly tacky, I personally like that feeling more than the feeling silicone primers give. I feel like my skin is then really moisturised and smoothed out. I have put my foundation on once or twice before its dry and it has made me kind of shiny so definitely give it a few mins. Like I said, this gives such a nice base to apply your make up to- soft, smooth and gives something for your make up to cling on to. I just really, really like how it makes my skin feel. With regards to prolonging wear of my make up, I'm not sure it does that, my make up seems to last the same amount of time and need the same amount of powdering. Saying that I do think it makes my make up look a lot more flawless and airbrushed as the skin is so well primed. Overall this gets a thumbs up from me, I've been reaching for this loads over other primers and for the bargain price tag I think its defo worth a go! I love how hydrated my skin feels after using it!